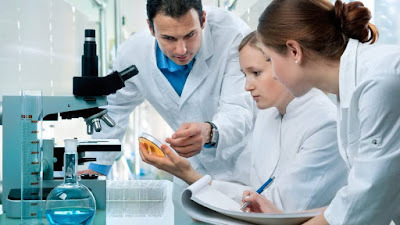 A medical laboratory scientist (MLS), also traditionally referred to as a clinical laboratory scientist (CLS), is a healthcare professional who performs chemical, hematological, immunologic, histopathological, cytopathological, microscopic, and bacteriological diagnostic analyses on body fluids such as blood, urine, sputum, stool, cerebrospinal fluid (CSF), peritoneal fluid, pericardial fluid, and synovial fluid, as well as other specimens. Medical laboratory scientists work in clinical laboratories at hospitals, reference labs, biotechnology labs and non-clinical industrial labs. See career opportunities for graduates of Medical Laboratory Science. BAYERO accepts Diploma in Medical Laboratory Science from a recognized institution. BENIN - Same as in Medical Biochemistry. Accepts degrees in related Science programmes. CALABAR accepts A Level passes in any two (2) of Chemistry, Biology and Physics, B.SC Biological Science; AIMLT or FIMLT plus UTME requirements. EBSU accepts AIMLS or its equivalent plus relevant UTME requirements. JOS accepts first degree in relevant Biological Science programme with at least a Second class lower division. JUPEB/A Level passes in Physics, Chemistry and Biology. B.Sc Degree first Class/Second class upper in medically related programmes. LAUTECH accepts A Level passes in Chemistry, and Biology with the UTME requirements OR ND/HND upper credit or first degree in relevant programme plus the UTME requirements. MAIDUGURI and IMSU accept certificate of Institute of Medical Laboratory Technology, Science/Technology (IMLS/T) of Nigeria plus the UTME requirements. MAIDUGURI accepts Zoology in lieu of Biology. NDU requires five (5) O Level credit passes in English Language, Mathematics, Chemistry, Biology and Physics. UNIZIK accepts HND/B.SC in Biological Sciences or related programme. (a) HND (Lower Credit) in relevant discipline. (b) OND/ND (Upper Credit) in relevant discipline. (c) At least two (2) A Level passes in Biology and Chemistry. B.Sc in relevant programmes with at least second 2nd class Lower Division plus O Level credit passes in English Language, Mathematics, Biology, Chemistry and Physics at not more than two (2) sittings. ND upper credit in related programmes plus the UTME requirements. A Level passes in Chemistry, Physics, Biology or credit passes in two (2) relevant O Level subjects. Candidates with AIMLS professional plus the UTME requirements. A Level passes in Physics, Chemistry and Biology or Zoology in addition to UTME requirements. OND/HND in related courses with an upper credit plus O Level entry requirement. AAU accepts B.Sc in relevant programme with good grade. Remedial results not acceptable. CALABAR - same as in Medicine and Surgery. IBADAN accepts five (5) 0 level credit passes in English Language, Mathematics, Physics, Chemistry and Biology at one (1) sitting. EUI requires five (5) credit passes at SSC or its equivalent in English Language, Mathematics, Physics, Chemistry and Biology. (i) BABCOCK accepts any three (3) of Physics, Chemistry Biology and Mathematics. (ii) RSUST requires Mathematics, Chemistry or Physics.